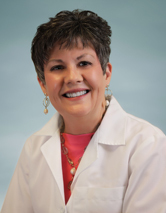 Dr. Mary Guiglia obtained her medical degree from the University of Kentucky College of Medicine. She went on to complete a residency in internal medicine at the University of Kentucky Chandler Medical Center and a residency in dermatology at Wright State University Medical School in Dayton, Ohio where she served as chief resident. Dr. Guiglia is certified by the American Board of Dermatology and the American Board of Internal Medicine. She joined DAK in 1990 and serves on the DAK Board of Directors. She is a member of the Alpha Omega Alpha Honor Medical Society, American Medical Association, American Academy of Dermatology, Kentucky Medical Association, Lexington Medical Society and Kentucky Dermatological Society. She also served as past president of the Kentucky Dermatological Society and past Secretary-Treasurer of the Lexington Medical Society. She is a Voluntary Medical Faculty Member at the University of Kentucky College of Medicine and has been selected as one of the “Best Doctors in America” by her peers since 2001. Dr. Guiglia is active in her church and enjoys time with family and friends.